On Wednesday 19 January 2011 a presentation was held in the Union Book Gallery (Στο­ά του Βι­βλί­ου) in Athens of a new two-volume work by His Eminence Metropolitan Hierotheos of Nafpaktos and Agiou Vlasiou titled "Empirical Dogmatics of the Orthodox Catholic Church According To The Oral Traditions of Father John Romanides". The event/presentation was organized by the distributor, the Holy Monastery of the Nativity of the Theotokos and Pelagia of the Holy Metropolis of Thebes and Levadia. 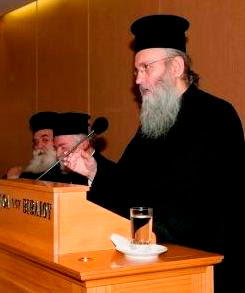 As the Abbess Silouani said in the opening of the event: "Until now there has been no presentation in Greece of any books by His Eminence, but I found it necessary to have a presentation of this present work 'Empirical Dogmatics of the Orthodox Catholic Church According To The Oral Traditions of Father John Romanides' in order to celebrate and honor the personality of the late Protopresbyter and University Professor, Fr. John, on the occasion of it being a decade from his repose" (+ 11/01/2001). The event was attended by His Beatitude Archbishop Ieronymos of Athens and All Greece, Bishops (among whom was Metropolitan George of Thebes and Levadia in whose jurisdiction the Monastery belongs), University Professors, Priests, and laity who filled not only Union Book Gallery but also a second room to capacity. It is worth noting the presence of certain persons, in addition to the speakers, particularly associated with Father John, such as his sister Mrs. Parthenia Romanides - Ott, who traveled from New Zealand to attend the event, and Mr. Athanasios Sakarellos, a student of Fr. John to whom, in his office, was given courses of theology and history before and after Fr. John's retirement, who saved several taped speeches of his, etc. The speakers who presented the book and spoke about Fr. John Romanides were the Reverend Protopresbyter and Emeritus Professor of the Theological School of the University of Athens Fr. George Metallinos, the Reverend Protopresbyter and Secretary of the Synodal Commission on Inter-Orthodox Relations Fr. Stephanos Avramidis, and Professor of the Theological School of Aristotle University in Thessaloniki Mr. Lambros Siasos. The event began with a short preface by the Abbess Silouani of the distributor Holy Monastery of the Nativity of the Theotokos, who spoke of her editorial work, since the Sisterhood "in parallel with other monastic tasks, engages also in editing, translation and distribution of literary works of our Spiritual Father, Metropolitan of Nafpaktos and Agios Vlasios Mr. Hierotheos. It is a service that resulted from his years of pastoral ministry, his involvement with the texts of the Fathers of the Church, and contributes to his missionary purposes and the preservation of our Monastery." His Beatitude Mr. Ieronymos thanked as well Metropolitan George of Thebes and Levadia for his paternal protection and practical interest in the Monastery. First, because of the long acquaintance and good cooperation with the then Clerical Preacher and now Metropolitan of Nafpaktos Mr. Hierotheos and with the Sisterhood of the Holy Monastery of the Nativity of the Theotokos which he leads and which lives and walks within the Orthodox monastic tradition of the Church. Second, for his personal joy in every new book of the Metropolitan of Nafpaktos. He mentioned that each time one is published, he asks: "How does he have time for all this stuff? How does he have time to be present everywhere at all the events, to give speeches on every issue, to respond to the press, and to leave us all in anticipated surprise, such as in this book?" Third, his personal acquaintance with Fr. John Romanides, with whom His Beatitude had many lengthy discussions. Lastly, because the presentation allowed teachers and clerics to discuss "fixed points which will be trampled" in our days, days of confusion. He also said: "I believe that when we have such instructors, whether it be University Professors with this spirit, or revered Bishops of our Church, or scholars of these works and presenters, I think that these particular antibodies in our times will help us tackle the many diseases, and will help us find the path we need." Finally, the Archbishop ended his speech with his gratitude and blessings: "Thank you very much Your Eminence, Holy One of Nafpaktos, and we pray in our hearts that God gives you much strength and enduring patience - not just patience -, so your work may be fruitful and may be for us a source of optimism, a hope for a difficult path." Afterwords a few words were spoken by the sister of Fr. John, Mrs. Parthenia, who with the help of translator and presenter at the event Mrs. Efi Mavromichalis, spoke with evident emotion of her personal experiences with her late brother, with whom she had never lost contact; even though they lived literally on opposite sides of the earth. She spoke of his many excellent skills and talents, his ability to navigate many types of aeroplanes, his music and athletics, she expressed the emotion for being able to attend the event of the presentation with colleagues and friends and people who loved and honored her brother, and expressed gratitude to the author: "Your Eminence Hierotheos, I knew of you very much before I met you. How unfortunate that the first time we met was at the funeral of my brother. I fervently thank you for your kindness because you uphold everything of my brother, and you were strongly loyal and faithful to him. My brother together with my mother are smiling and are very happy." Fr. George Metallinos spoke next as coordinator of the event. Fr. George paralleled the "resurrection earthquake" which followed the passing of Fr. John in Modern Greek reality with the publication of the present volume, in which the author offers "the very essence of the theology of our new great dogmaticians", in a version that is exemplary and expressed appropriately for this purpose. He said: "I believe that the Holy One of Nafpaktos was the most suitable for the synthesis of this monumental project and theologically is the best successor of Fr. John, and as an ecclesiastical hierarch even informally expresses to the Holy Synod of our Church constantly the empirical theology of Orthodoxy, the essence of our theology that is." He considers it a very important publication considering the reigning spiritual and theological crisis of our nation. Briefly he went over his personal assessment of of the work of Fr. John, renewing the belief that we can speak about a pre- and post-Romanides epoch in theological matters in Greece. Father John "upset all the needlessness, the pietism and magical vision we had for the Church and her mission in the world. He brought back to the surface the need for asceticism and a holy spiritual life, the need for uncreated divine grace and how to acquire it by means of synergy with our God. Above all, he separated us from intellectual theology, and rejoined dogma and worship and tied them with history, enlightened with the light of our tradition, and he saw this in a western academic environment." Fr. George also spoke of the students of the late ever-memorable Fr. John, the hidden and known, as well as his enemies, which in the person of Fr. John they are at war with the patristic theological tradition. He also noted the skill of the book by presenting the direct and natural personality of Fr. John Romanides. Finally he ended with words by the ever-memorable Fr. Theoklitos Dionysiatis about Fr. John. The next talk was delivered by Fr. Stephanos Avramidis, who spoke of his old acquaintance with Fr. John in America, where he was professor at Holy Cross School of Theology in Boston, and how he enjoyed his "exhilarating teaching". This is where Fr. John "opened their eyes" to theology, he taught them the theological foundations of different methods and lifestyles observed between Orthodox and Catholics and Protestants who dominated the population, giving Orthodox criteria to theologize and choose from and to cease using the heterodox theological counter-rhetoric. He taught them about Orthodox dogma as the experience of deification, introducing them to the scientific study of patristic theological thought on the one hand, and the philosophical background of the heterodox and heretics on the other hand in order to understand in depth the cause of the diversification of their theology. He cleared away concepts of scholastic and philosophical misconceptions from the Bible, etc. C. The distinction between essence and energy. He also spoke of the criticism of the theology of Blessed Augustine and the dogmatic and symbolic works of the Orthodox Church. As to the similarities which bound him to Fr. John, he emphasized the love of his lessons, their common origin, their common spiritual father Fr. George Florovsky, of whom he made extensive references, the Holy Monastery of the Transfiguration in Boston which at one time gave hospitality to the mother of Fr. John, or "Grandma Romanides" (γιά­για-Ρω­μα­νί­δη) as the students called her. Lastly he spoke of their reacquainting in Greece where they cooperated in their service to the Church and the Holy Synod. Fr. Stephanos finished by saying: "When he left us on 1 November 2001 to go near to Christ Whom he loved so much and served, to all of us who knew him and loved him, and by his personality and teachings made an indelible impression, he left a void within us, which even until now time has not been able to heal. May his memory be eternal." Professor Lambros Siasos presented the book with a particular eloquence and rhetoric. He spoke of the critical method he read the book taught to him by Fr. John in order to judge the publication, observing even the title and cover, describing "the subtle hand embroidery, the love for beauty, the uncommon, the novel." He spoke of the remarkable control of the vast material in the hands of the writer, who worked with the method and thought of Fr. John, since the Metropolitan of Nafpaktos was taught by Fr. John Romanides "and now it is something honorable, honoring his teacher." He presented the original title of the book of two known terms of "empirical theology" and "dogmatic and symbolic theology". He went from the "phenomenon" of the book to the "noumenon", underlining that "the communion of the mystery of the Cross and the Resurrection of Christ occurs with the synthesis of the Holy Mysteries and asceticism." He presented the book as a cross, at the basis of which is the lamentation of a Bishop for all the changes which hurt the ecclesiastical body, which he does not list with his own words, but "puts the voice of an intractable Cappadocian to recount them". While ostensibly the book follows the outline of a conventional dogmatics book, it is presented with the Doric form of the Symbol of Faith and "overturns the catering and support to the establishment", with a central axis that elaborates the empirical fact of God's self-manifestation to the purified Prophets, Apostles, and Saints, followed by the recording of the manifestation of that revelation with created words and meanings, with the highest form of theophany being Pentecost. He described the feat of the Metropolitan of Nafpaktos as "using the teachings of Romanides he completed what Fr. John did not have time to", and introduced the hesychastic, ascetic, and empirical theology in all the chapters of theology, in this case dogmatics, and introduced it, or as the author of the introduction says, he "restored" it, within the ecclesiastical body, that is, within the Holy Mysteries. He stressed two key points concerning the entire work: a) the distinction between nous and logic or noetic energy and logical energy, and b) the distinction between ecclesiastical empirical theology and speculation. He added that in accordance with St. Gregory Palamas there can be highlighted the distinction between the experience of divine theology and the experience of demonic "theology". Lastly, he said that the success of the book is already given in terms of traffic, and on the spiritual side will manifest itself every time a person reaches the stage of perfection towards heaven and every time a priest will heal by the Grace of God a person. Finally the writer His Eminence Metropolitan Hierotheos of Nafpaktos spoke, who thanked the presenters and presented the four "how's" which concern the publication of the project, that is, a) how he discovered Fr. John Romanides b) how he appreciated his writings c) how he worked to get done the two-volume work of "empirical dogmatics" and d) how he felt about Fr. John Romanides, particularly as he worked with his writings. His Eminence stressed the unifying vision that was the theological work of Father John on the basis of the spiritual therapy of Christians, as well as the criticism issued to heretics and heterodox which formed this perspective, in that he saw the heresies and falsehoods as disruptive of the unity of Christians. He announced that he was studying this particular aspect of the theological offerings of Father John and eventually will publish this study. Finally His Eminence thanked the organizers of the event who helped in editing the book. In particularly he mentioned the distributor Holy Monastery, Mr. Athanasios Sakarello because in the office of Fr. John he was taught by him and he saved a large number of tapes, "His Eminence Metropolitan of Thebes and Levadia Mr. George, dear brother in Christ, who blessed this effort, which is the missionary work of the Monastery and the handiwork of the nuns," His Beatitude Mr. Ieronymos, "who as Bishop of Thebes and Levadia protected me and the Monastery and was the main cause of all this work, even the distribution." He prayed that "God may rest the soul of the blessed Fr. John Romanides, the Theologian and 'Prophet of Romaniosini' for the hard work he did to teach the 'empirical dogmatics' and, of course, the reminder that we have a duty to care for how dogma will become our food and life." His Eminence concluded the speech with a quotation from Alexei Komiakov, according to which the leading figures are not leaders of their generation, because they go far ahead their generation that cannot comprehend them because they are not ready, but they lead the subsequent generations. One such leader was, in accordance with His Eminence, Fr. John Romanides, who affected his generation, but will affect more future generations. Father George Metallinos closing the whole event thanked His Eminence for everything, and announced the happy event of the translation of works by Fr. John in languages of the Eastern Orthodox, which was "blocked by an invisible hand." The event ended with a video presentation and audiovisual material was heard with the voice of Father John. We will close this brief report of the important event/presentation with the words of Fr. George Metallinos: "If the passing of the blessed Fr. John Romanides created a 'resurrection earthquake' in Greek reality, which delivered us from our theological-ecclesiastical babylonian captivity, the same applies to the two-volume work of His Eminence Metropolitan of Nafpaktos and Agios Vlasios Mr. Hierotheos concerning the theology of Father John."